The waste industry has called for $150 million “circular economy and action plan” to fix recycling uncertainty. So, what is a circular economy and why is it important for Australian manufacturers? Here’s what you need to know. If you haven’t heard by now, there are big changes afoot in the world of waste. China imposed a ban on 24 types of foreign solid waste and recyclable material in January. This has left Australia, which relies heavily on China as a destination for more than 600,000 tonnes of waste per year, looking for other opportunities. But rather than trying to find new export markets, there’s another solution that could help avoid this waste going to landfill: the creation of a circular economy. The Waste Management Association of Australia (WMAA) and the Australian Council of Recycling (ACOR) have come together to call on all government ministers to work with industry in developing and implementing an Australian Circular Economy & Recycling Action Plan. However, a circular economy is much more than recycling; it would transform Australian manufacturing as we know it. Currently we have a traditional linear economy: we take, make, use and dispose. It’s also called the “throwaway society” because of the sheer amount of stuff we throw away. Today’s economy is built on a fast turnover principle. Think about your mobile phone: you are encouraged to swap your phone within a year or two – even if there’s nothing wrong with it. A circular economy is essentially the opposite, it means we keep resources in circulation for as long as possible. We extract maximum value from them while in use, then recover and regenerate products and materials at the end of their service life. Products are repaired, reused or upgraded rather than being thrown away. This means designing products for longevity and reparability, while also designing waste out of the system. Waste from factories, for example, becomes a valuable input for another process. Is Lean manufacturing + Industry 4.0 together the next level of operational excellence in reducing waste? One of the biggest advantages of a circular economy is its potential to create new opportunities for growth. By extending the life of products and material, we can recover the full value of products, which in turn creates new business opportunities, revenue streams and jobs. The result is a more competitive Australian economy. At the same time, it prevents the over-generation of waste and reduces the environmental impacts of mining, resource extraction, refining, manufacturing and consumption. One great example is UK supermarket Sainsbury’s recent announcement that one of its stores would “close the loop” by using its own food waste to power the store. Interested in how the world is tackling food waste? Or what the National Food Waste Strategy means for food labelling? 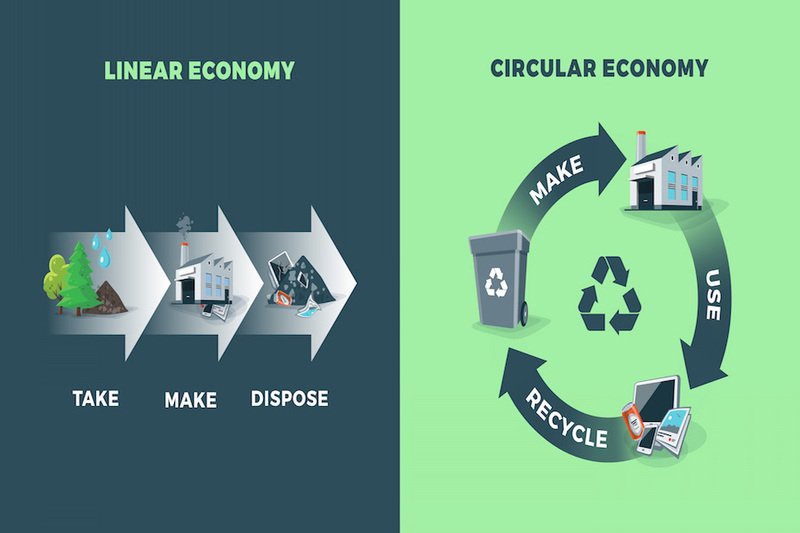 How can we transition to a circular economy? As Einstein said: “We can’t solve problems by using the same kind of thinking we used when we created them.” The circular economy requires a radical rethink about the way we make stuff. We need to design products that can be “made to be made again”. Data collection and sharing: Data lies at the heart of the circular economy. This is where the Industrial Internet of Things (IIoT), or Industry 4.0, can help the transition. With the IIOT, each component that goes into a manufacturing process can tracked through its lifecycle. The data collected allows supply-chain players to know the source of the product, how it was produced, and the resources consumed. Extended producer responsibility: For a circular economy to work, there also needs to be extended producer responsibility(EPR). This means manufacturers and producers are responsible for the products they make or sell, and any packaging, when they become waste. What does a circular economy mean for manufacturers? Far from being a threat to manufacturers or the latest “sustainability fad”, a circular economy is about capturing value that would otherwise be lost. For manufacturers, this means getting more value out of the energy, materials, and other resources they use. It’s not just global corporations; SMEs can also make a difference. Coconut Bowls is a Melbourne-based enterprise that takes discarded coconut shells, then sands and polishes them and sells them to consumers as bowls they can eat from. Owner Jake McKeon says that this product is not just a bowl; it’s an experience that “highlights a better way of doing things”. The company is a great example of the circular economy business model, showing how you can create a value stream from a waste stream. An EPR scheme would also change the game for manufacturers. The panel at the Plasticity 2017 conference in Sydney said rolling out an EPR scheme could mean giving producers an incentive to change product design, making it easier to reuse or recycle products, and imposing fines if certain waste rules are not met. In Japan, an extensive EPR law covers the lifecycle of products from various industries and requires manufacturers to use recycled materials and reusable parts in new products. The UK also has a successful approach, which includes an aggregates levy for construction industry. This alone has increased recycling rates of aggregates to 25%, while lifting the market for recycled aggregates. Transitioning to a circular economy is no longer a choice – it’s an imperative. We need to move away from linearity and embrace circularity. But it won’t happen overnight; we must think and act differently if we are to make the transition. One manufacturer or industry acting alone is not enough to make this happen. More than ever, companies need to work together, partner and leverage their value chain to find creative solutions. This transformation is a journey – it will take time and effort, but the rewards are immense. Trent Munro is an accomplished business strategist, marketing innovator and speaker specialising in business development and optimisation. Over the past 15 years, he has worked across a range of blue-chip and medium enterprises including Goodyear Automotive, Clariant, Corona Manufacturing and Matthews Australasia. Trent holds a range of postgraduate and graduate qualifications in Commerce, Psychology, Project Management and Science. At Matthews Australasia, he has overseen market development locally and abroad, launching class leading traceability and automation technologies across manufacturing, healthcare and logistics.